A unit of measure used in the American timber trade. One board foot refers to a piece of unmilled wood 1 foot x 1 foot x 1 inch, or 144 cubic inches. Twelve board feet equal one cubic foot. annually. Between 1832 and 1888, Bangor shipped out 8.7 billion board feet of lumber. A narrow strip of wood used for latticework, such as on a lobster trap, or to support another surface, such as a plaster wall., and fence posts. Winter lumbering complemented shipping. Ice often blocked the Penobscot River from December through March. Once navigation opened, the spring rivers brought winter cut lumber down river, where a fleet of vessels carried it to the expanding cities of the U.S. eastern seaboard, the Caribbean, and South America. A sailing vessel of two or more masts, all fore-and-aft rigged. The Thomas W. Lawson, built in 1902, had seven masts. In comparison to a square-rigged vessel of comparable tonnage, a schooner is better for coastwise sailing. of the 1870s helped more lumber reach a bigger market. 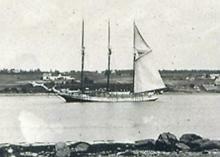 In 1860, there were 3,376 vessel arrivals in Bangor.